Nimah has been an initiator, speaker and organizer of youth forums in various countries with themes related to youth empowerment since 2000. This includes her facilitation and organization of a first of-its-kind youth forum –-World Café Style–held in Jeddah that included the two genders in one session with 150 youth participants ranging in age from 16 to 25 years old at the Knowledge Economy Conference whereby youth formed their own companies and proposed innovations that yielded 30 proposals. 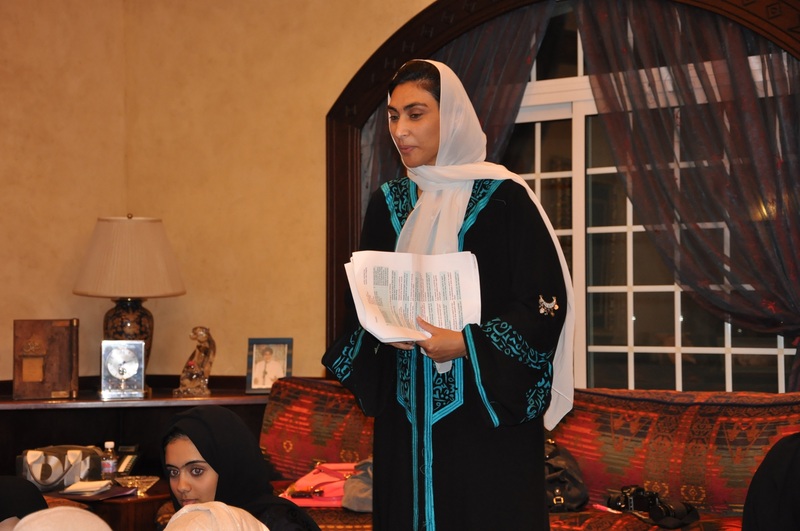 She has since led numerous youth forums and workshops including a UK-Saudi Youth Forum and continues to mentor youth– one on one and in much larger groups in a variety of projects. A pioneering supporter of the voice of Saudi youth, enhancing skills and competencies, unearthing hidden talents as well as encouraging youth participation and decision making, she continues to be a strong advocate and a role model for this marginalized segment of society that holds the key to the future in their hands. She has also led several workshops on writing and the journey of the pen at a competition entitled “Imagine 2020” held in Saudi Arabia. She headed an Eastern Province- led youth campaign for the relief of flood-hit Jeddah victims in 2010, initiating and implementing aligned efforts of numerous youth groups to offer aid to flood victims in a systematic and speedy manner. As director of the relief campaign she led the groups in mobilizing awareness initiatives, spreading messages of the need to offer aid to a wider range of those in need across the country. This inspired other youth groups in neighboring regions to join the efforts. Ni’mah organized and led a wide range of workshops and forums on leadership, discovering talent, journalism, blogging, poetry, youth and change, volunteering and held cultural events geared towards expanding youth empowerment through a variety of competencies and life skills. Her involvement with youth includes the vital need to help youth with job skills and job placements be it in the Middle East or beyond, as she is a firm believer in the need to prepare the future workforce for prospective needs of the labor market. She has been working closely with several emerging young leaders and entrepreneurs who seek mentorship and advise in their chosen track, building their acumen, working on their CVs, networking, development and inclusion at forums and at venues which will aid them in their growth and path. Ni’mah tirelessly contributes to multifaceted initiatives, supporting a wholesome approach to youth empowerment, networking and development. Her numerous volunteer activities support volunteer programs by youth from the start up phase through to carrying out the steps and programs and bringing them to fruition.She is a very strong supporter of young filmmakers, photographers, graphic artists and calligraphers and has promoted the work of emerging filmmakers and graphic artists in several productions and projects to date. She often works hand on either one on one or with teams on artistic works ranging from poetry, journalism, photography and film making to calligraphy and graphic design and offers them opportunities to develop and network with specialists in their fields, find jobs, and pursue their projects or studies in their respective fields.